Flanked by two imposing buildings in a passageway off North Terrace, this primordial-looking sculpture could be easily overlooked by passersby, but it’s worth stopping to admire its quiet power, writes Katherine Arguile. As construction work on the Southbank precinct continues, those who want to access the Adelaide Festival Centre and the Riverbank Bridge from North Terrace have to do so along the narrow passageway between the Intercontinental Hotel and the Casino. Nestled there, just to the eastern side of the main entrance to the hotel, is a sculptural installation: Mandorla, by Australian sculptor and ceramicist Marea Gazzard (1928-2013). It’s easy to miss if you’re deep in conversation with those you’re walking with, or distracted by your phone. Commissioned by the ASER (Adelaide Station and Environs Redevelopment) Property Trust, the work was completed in 1993 and installed a year later. 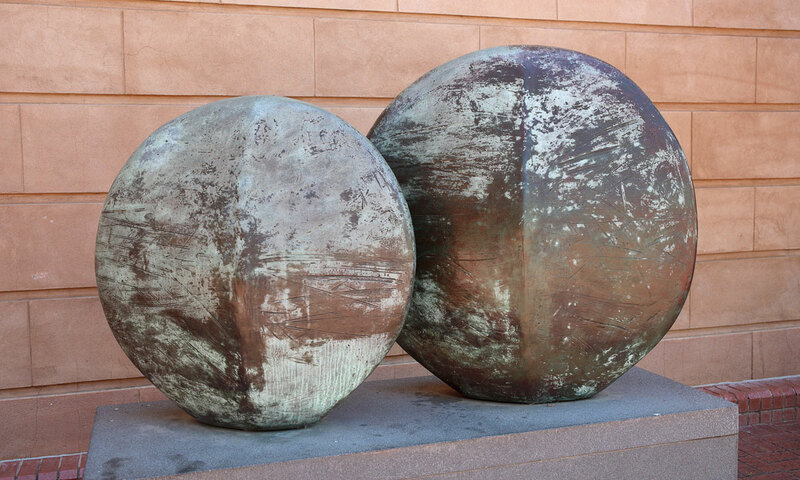 Cast using the lost wax technique, two bronze discs — both convex with a slight ridge along the midline of each of the flat sides — sit on a rectangular plinth of smooth unpolished granite. Both are speckled and smeared with lichen-coloured patina, and the sculptor has gouged deep scratches and etched marks here and there on their surfaces, giving them the appearance of bedrock emerged from under an ancient glacier. They evoke the shape of hard, round seeds, or sand-dollars, or turtle shells, and look primordial, as if they’ve been there forever and will remain long after everything else is gone. One is slightly bigger than the other — its top reaching the height of a taller-than-average human — standing parallel and slightly behind its smaller companion. Move to the side of them, and the discs morph into slender ovals, echoing the name of the work: Mandorla (the Italian word for almond) is the name used in art to represent the almond-shaped halo of light that surrounds holy people in art. Flanked tightly on either side by two imposing buildings, the sculpture seems smaller than it really is, but it sits between them, quiet and powerful, without being overwhelmed. Marea Gazzard was born in Sydney, and studied for four years at London’s renowned Central St Martin’s School of Art where she was taught by British art luminaries Eduardo Paolozzi and William Turnbull. She also became close friends with respected British ceramicists Lucie Rie and Hans Coper, reinforcing her commitment to the craft; when she returned to Sydney she studied sculpture under Lyndon Dadswell at East Sydney Technical College. Later, Gazzard cast large public works in bronze, such as Mingarri: The Little Olgas, commissioned in 1988 for the Executive Court of Parliament House in Canberra. She was a champion of the International Arts and Crafts Movement while embracing European modernism, and other influences included Cycladic sculpture, which she encountered while visiting her father’s family in Greece. The ridged broad surfaces of Mandorla evoke those ancient Cycladic faces: smooth and featureless, save for the gentle ridge of a nose. Her 2013 obituary in the Sydney Morning Herald described Gazzard as someone of “great dignity and humanity”, and her work as “timeless and elemental”. This modest and mighty sculpture is infused with all those qualities. In the midst of the transient comings and goings in the Riverside precinct and of the hotel and the casino on either side, Mandorla sits as a reminder of all that endures. This article is the second in an InDaily series on public art in Adelaide by Katherine Arguile. Her previous article looked at the sculptural installation The Lie of the Land in the Adelaide Parklands. Arguile has a BA Hons in Chinese Studies and Art History from Cambridge University, where she was an art critic for Varsity newspaper. She also has a Masters specialising in post-World War II British art from London University’s Courtauld Institute of Art, and a PhD in Creative Writing from the University of Adelaide.